Judaism is one of the three major monotheistic religions, and the oldest. It is founded on the belief in one God, who gave His laws to the Israelites. Judaic law is mainly found in the Torah, which refers to the Five Books of Moses - Genesis, Exodus, Leviticus, Numbers, and Deuteronomy - and in the rest of the Jewish Bible, known to Jews as the Tanakh and non-Jews as the Old Testament. Besides the Five Books of Moses, the Tanakh includes books about different prophets, prophecies, as well as Psalms, Proverbs, and other stories relevant to the laws. The Aron HaKodsh (Holy Ark) - often the most defining part of the synagogue, found at the front of the synagogue, usually ornately decorated, with Hebrew writing around it. The ark houses the Torah scrolls, which are removed during the service to be read. This ark symbolizes the ark carried by the Israelites through the desert, which held the tablets of the Ten Commandments. Torah scrolls - Torah scrolls are hand-written on animal parchment by a scribe specially trained for the task. Because of the time-consuming and exacting process of writing out the Torah scrolls, it can take up to a year to complete one scroll, and they are usually very expensive, but thanks to the quality, they can last for hundreds of years. 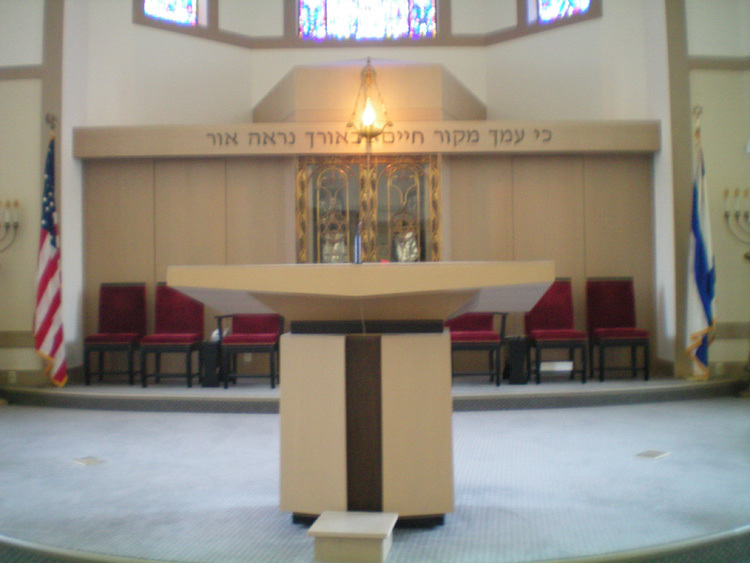 Bimah - elevated platform or podium from which the Torah is read or service is led. Ner Tamid (Eternal Light) - a light found above the Ark which is always lit, symbolizing the eternal presence of God. Menorahs - seven-branched candelabra, usually found on either side of the Ark, which symbolize the six days of creation and the Sabbath day. 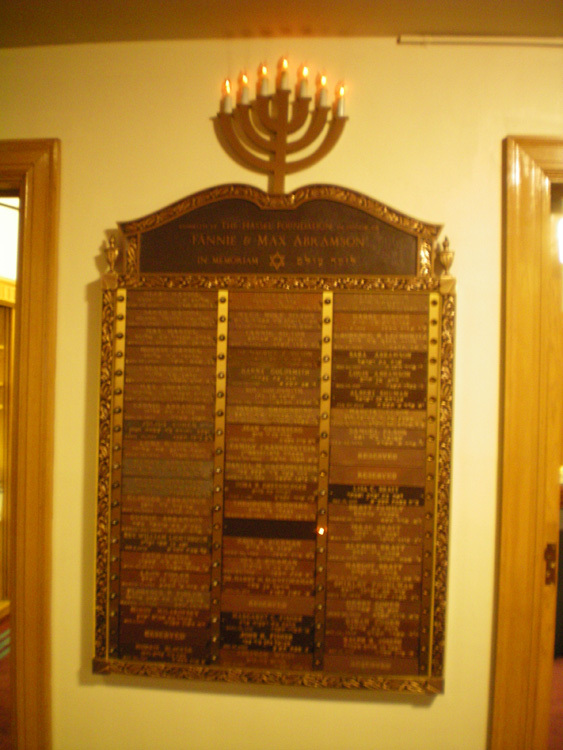 Memorial markers - either on the walls of the synagogue or to the side, these markers have name plaques on them, each with a small light next to it, to commemorate members of the congregation who have died. The lights are lit on high holidays and/or during the month or week that the person died. 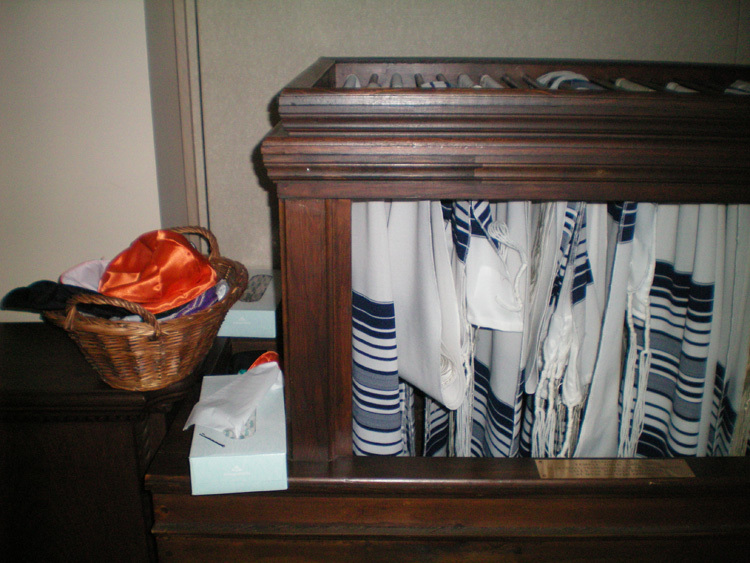 Most synagogues, although perhaps not all, will also have prayer shawls (Hebrew - tallit) and skull caps (Hebrew - kipah, Yiddish - yarmulke) available for members of the congregation who may not have their own. Besides the Ark, synagogues are not usually elaborately decorated. There may be symbols of the 12 tribes of Israel or certain symbols important to the Jewish faith, but there will not be any statues or paintings. There are few physical features that can distinguish Orthodox, Conservative, and Reform synagogues from each other. 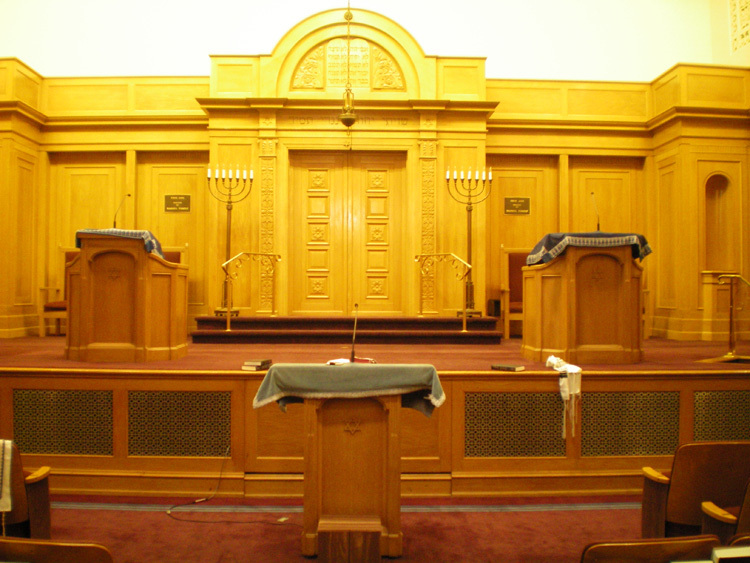 One of the only distinguishing features is found in Orthodox synagogues, where there is separate seating for men and women, with sections either separated by a banister or railing or, sometimes, different levels. The true differences between these three movements of Judaism come in how they understand the origin, flexibility, and adaptability of the laws given in the Torah. The Bimah and Ner Tamid of Reform Congregation Oheb Sholom, Wyomissing. Caps and prayer shawls provided by Oheb Sholom for their members. 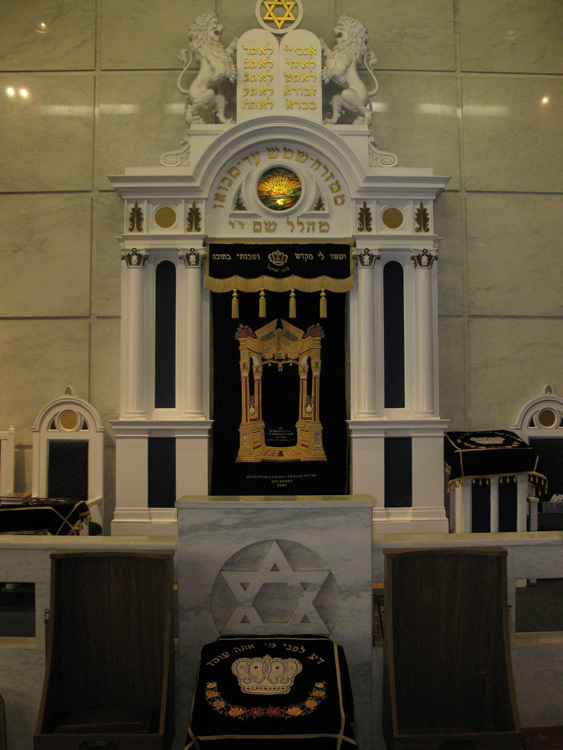 The Holy Ark, Bimah, and menorahs at Kesher Zion in Reading. The Holy Ark at Kesher Israel in Harrisburg. A memorial marker at Kesher Zion. The lights next to each name are lit to commemorate the anniversary of the person's death. 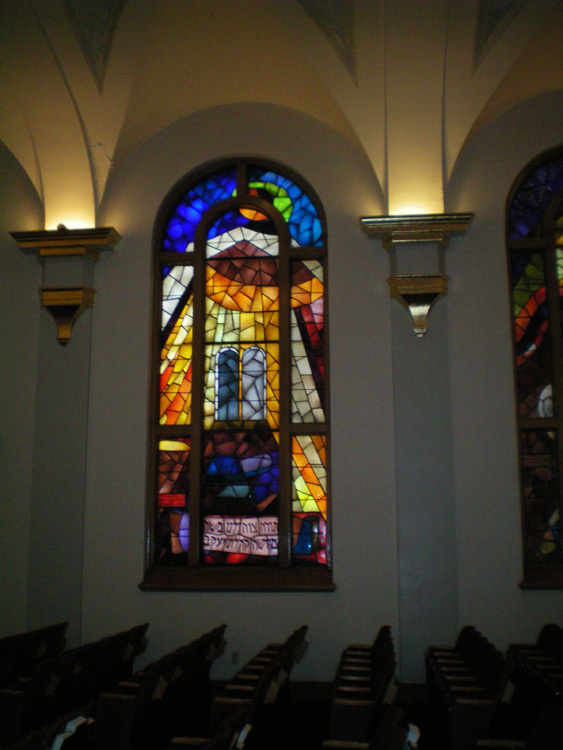 A stained glass window in Kesher Zion that depicts the two stone tablets on which the Ten Commandments were originally written.